These Asian-style fritters make excellent appetizers, dipped into the spicy mayo, or can be eaten as burgers for a main course. 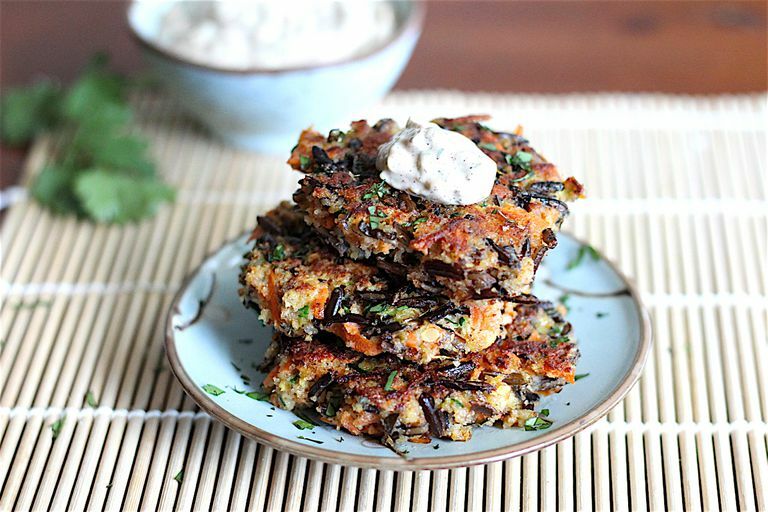 They are a delicious way to sneak some extra low-FODMAP vegetables into your day. Wild rice does take up to an hour to cook, so consider making it the day before or purchasing it pre-cooked. In a small bowl, stir together the mayonnaise, lime juice, ground chile, red pepper flakes, and cilantro. Refrigerate until ready to serve. In a medium bowl, mix together carrots, zucchini, and salt. Transfer the mixture to a wire strainer and place the strainer over the bowl. Let the vegetables rest for about 20 minutes, pressing on the mixture every 5 minutes or so to release excess water into the bowl below. While the carrot and zucchini mixture is draining, in a separate medium bowl, combine the scallion greens, ginger, seaweed, rice, and breadcrumbs. When it becomes difficult to squeeze any more water out of the vegetables, add them to the breadcrumb mixture. Mix in the eggs. Form nine fritters in your hands by compacting a small handful of the mixture and flattening it into patties about ¾-inch thick. In a large skillet, heat the sesame oil over medium heat. When it is shimmering and fragrant, add the fritters. Cook the fritters for 4 to 5 minutes on each side, until they are golden brown on the outside and steaming hot on the inside. Serve with spicy mayo. Cooked brown rice can be substituted for wild rice. Add more ground chile and red pepper flakes if you prefer more heat. All wild rices aren’t the same; some types may take a little longer to cook, absorb a little more water, or yield more than one cup of cooked rice. To end up with 1 cup of cooked rice, start with 1/3 cup dry rice and 1 cup of water in a small saucepan. Bring it to a boil, then reduce heat and simmer until the seeds split open and become tender, about 45 minutes. Add a little more water if it dries up before the rice is done. Measure 1 cup of the cooked rice to use in the recipe. Grated, drained vegetables can be prepared well ahead of time. Commercial gluten-free panko or breadcrumbs (without onion or garlic powder) can be used in this recipe, or you can make your own low-FODMAP breadcrumbs by grinding sourdough toast, which is naturally low in FODMAPs due to the fermentation process it undergoes, in a blender or food processor. You will wish you had leftover spicy mayo to use on a sandwich or as a salad dressing, so consider making a double batch.